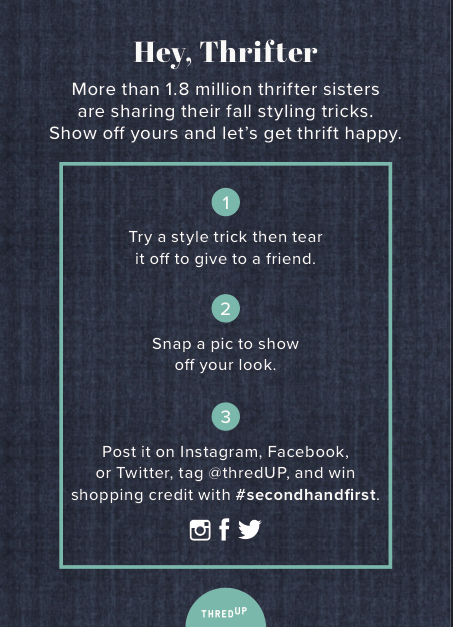 thredUP is the largest online secondhand site and a leader in the resale industry. This is a brand that's all about fun, fashion, and purpose—and a voice that packs a punch. I was hired as a Senior Writer to push the startup's brand voice into more impactful and irreverent territory. Four months later I was promoted to Editorial Manager to lead a team of three Senior Writers and the company's top-performing marketing campaigns. 'Tis the season to thrive. For the 2017 holiday season thredUP invited secondhand shoppers to explore a magical world of thriftiness full of brand discovery, style tips, and fun ways to recreate meaningful gifts. 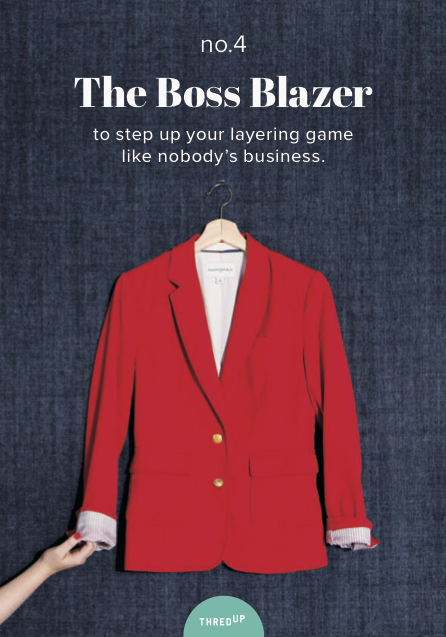 This 16-page newsprint collateral hosted the campaign's core service and inspirational content. A style guide for playing with the clothing thredUP has dealt you—without getting lost in the shuffle. This deck of cards brought surprise and delight to thredUP's unboxing experience with fun ways to style fall essentials and handy hacks to make outerwear last. 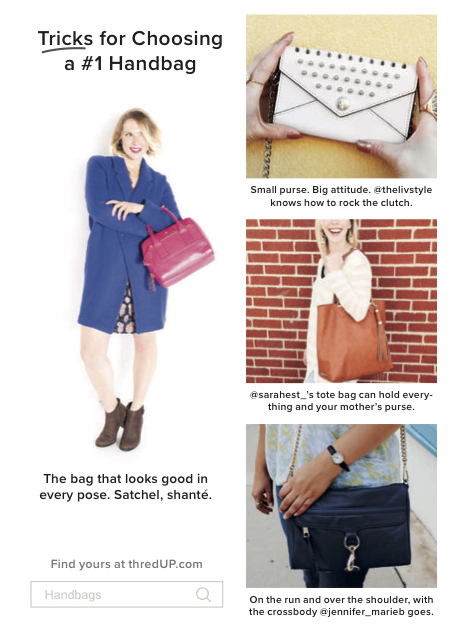 The backside of each card featured user-generated style inspo sourced from thredUP's #secondhandfirst hashtag. That feeling when you see a polka-dot box waiting on your door step...the goal for this packaging redesign was to capture the emotion of opening a thredUP box. It was an invitation to play with the brand voice and test new boundaries to see what would resonate with #secondhandfirst fans (and their cats). Here are the winners. 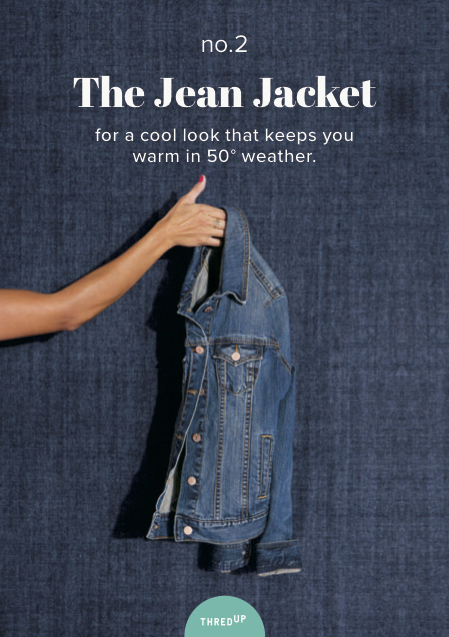 Being a conscious consumer matters, and thredUP wanted to empower its customers to feel good about the smart lifestyle choices they're already making. This 18-page accordion book showcased one of the brand's core pillars and invited thrifters to liveUP with feel-good challenges for every day of the week. thredUP is not your typical thrift store, and these irreverent emails aren't your typical winback campaign. Instead of wooing her with romance, we wanted to win her back with wit. I concepted and wrote copy using observational humor that makes fun of traditional winback messaging, giving her something she would want to read and, more importantly, drive her to shop. 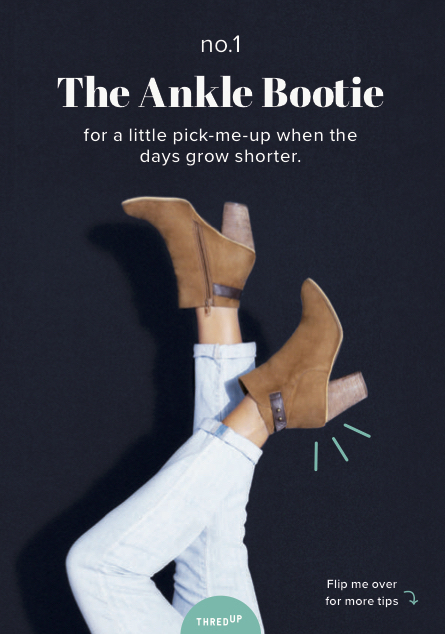 This email campaign launched in fall 2017 and generated over $30,000 within its first month. The average woman only wears 40% of the clothes in her closet. That means 60% of her closet never sees the light of day. Becoming a zero-waste consumer is about doing more with less, so thredUP's Earth Day campaign introduced the concept of #1in1out—for every new item we put in our closets, clean out one piece of unworn clothing. It was the brand's most successful marketing campaign of 2017, generating over $2 million in three days. Valentine's Day, Schmalentine's Day. This campaign was about celebrating February 14th for the pun of it. These printed Valentine's cards were placed in every order to drive her and her friends to shop and enter in thredUP's #punnyvalentine social contest. In the age of fast fashion and retailers who restock racks with new trends every week, the biggest issue we face isn't fashion fomo—it's throw-mo, the fear of throwing out. thredUP's spring cleaning campaign was on a mission to make cleaning out fun and easy, and these educational videos inspired by cats and our favorite pop-culture moments proved to be strong engagement pieces. "Keep it or sell it?! How long has it been since you cleaned out your closet? 😩 We can help! 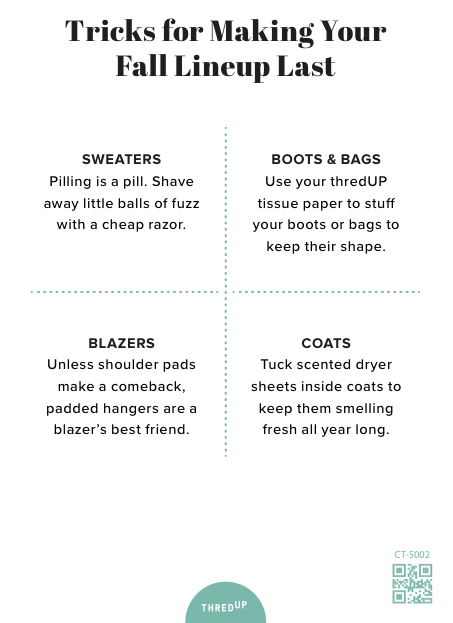 Order a Clean Out bag, shed some clothes, and feel all the more lighter. 🌹 (Tap the link in our bio to get started) ♻ 📲"
"Do you have a best bud who will always be honest with you about your fashion choices? 💃🏻💃🏻 How long has it been since you cleaned out your closet? Order a Clean Out bag, shed some clothes, maybe have a little fashion show while you're at it." "Calling all 😸 ladies! (You know who you are 😽.) If your feline friend has been giving your favorite outfit a little too much ❤, give your clothes (and maybe your 🐈) a good rub down with a lint roller. Tap the link in our bio to get more tips like these for making your 👕 look 😻, whether you're selling 'em or you just want them to look awesome." "You know when #winewednesday happens and your 🍷 gets on your ⚪️ and you're all like 😤 😩 Face palm no more. Use a stain remover stick to put a cork in all those wino whoopsies. Tap the link in our bio to get more tips like these for keeping your 👚 👗 👕 looking ✨." "Pilling is such a pill, amiright? 💊🙄 Here’s a trick for showing all those little balls of fuzz who’s boss: shave your sweater with a cheap razor (shaving cream optional). Tap the link in our bio to get more seller tips like these for making your 👕 look 💯. " "Don't be 'frayed of a little needle and thread. 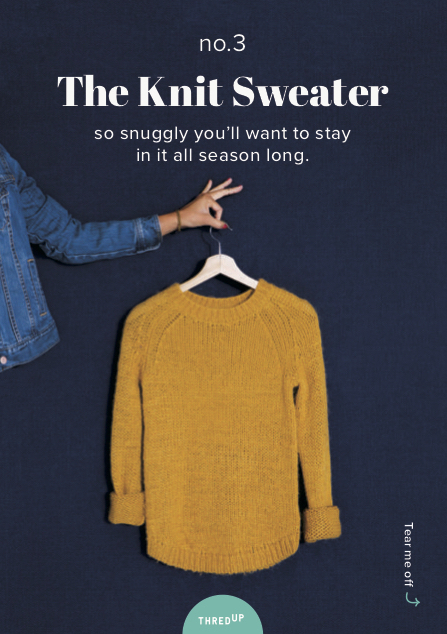 It's all you need to put that button back on your button-up and make that cashmere sweater even more sellable (or just wearable)! Tap the link in our bio to get more seller tips like these for making your 👚 look as good as 🆕. "